[Jbremnant] wanted to try his hand with ANT+ wireless networks. This protocol is designed for light-weight and low-power consumer electronics, like heart rate chest straps and bicycle computers (Garmin brand devices for example). There are already libraries out there for Arduino, but [Jbremnant] found that most of them were written as slave-only code. He set out to use an MSP430 to drive a fully functioning ANT network including a computer and an Android phone. The TI Launchpad is used as the master node in the network. 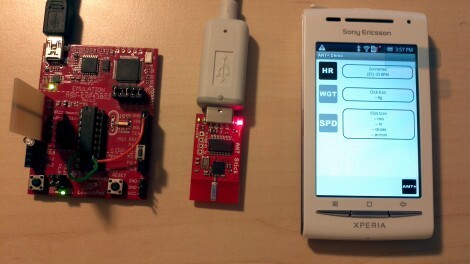 [Jbremnant] chose the smaller of the two MSP430 processors that came with the dev platform. After starting down this road he realized that chip didn’t have a hardware UART needed to communicate with the SparkFun ANT board (based on the nRF24AP1 radio chip). Rolling with the punches, he used a software UART he had previously worked with. Now he’s able to transmit test data from the Launchpad. It is picked up by both a USB dongle on his computer and the Android phone seen above. Check out his demo video after the break. I’ve been wanting to grab data directly from my PowerTap cycling Watt meter. I’m glad for the primer, especially since I like MSP430 development. glad you found it useful. I favor the msp430 dev over other mcu’s as well. i have HTC wildfire android can i use it with? hey , i want to interface my android with the receiver of my aerial vehicle that uses a x bee module , i.e. i want th e gravity sensor of my android to control my aerial vehicle …. Clemens on Need A Small Keyboard? Build Your Own! Miroslav on Need A Small Keyboard? Build Your Own! Antoine Pintout has updated the project titled //sine.stimu.lu/s ( WATCH + GPS + PAGER ).